For the ice hockey team, see HC Keski-Uusimaa. 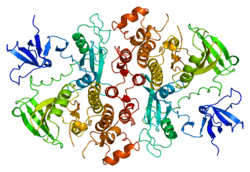 Tyrosine-protein kinase HCK is an enzyme that in humans is encoded by the HCK gene. The protein encoded by this gene is a protein-tyrosine kinase that is predominantly expressed in hemopoietic cell types, and belongs to the Src family of tyrosine kinases. The encoded protein may help couple the Fc receptor to the activation of the respiratory burst. In addition, it may play a role in neutrophil migration and in the degranulation of neutrophils. Alternate translation initiation site usage, including a non-AUG (CUG) codon, results in the production of two different isoforms, that have different subcellular localization. ↑ Quintrell N, Lebo R, Varmus H, Bishop JM, Pettenati MJ, Le Beau MM, Diaz MO, Rowley JD (August 1987). "Identification of a human gene (HCK) that encodes a protein-tyrosine kinase and is expressed in hemopoietic cells". Mol Cell Biol. 7 (6): 2267–75. PMC 365351 . PMID 3496523. ↑ "Entrez Gene: HCK hemopoietic cell kinase". ↑ Poghosyan Z, Robbins SM, Houslay MD, Webster A, Murphy G, Edwards DR (Feb 2002). "Phosphorylation-dependent interactions between ADAM15 cytoplasmic domain and Src family protein-tyrosine kinases". The Journal of Biological Chemistry. 277 (7): 4999–5007. doi:10.1074/jbc.M107430200. PMID 11741929. ↑ Stanglmaier M, Warmuth M, Kleinlein I, Reis S, Hallek M (Feb 2003). "The interaction of the Bcr-Abl tyrosine kinase with the Src kinase Hck is mediated by multiple binding domains". Leukemia. 17 (2): 283–9. doi:10.1038/sj.leu.2402778. PMID 12592324. ↑ Lionberger JM, Wilson MB, Smithgall TE (Jun 2000). "Transformation of myeloid leukemia cells to cytokine independence by Bcr-Abl is suppressed by kinase-defective Hck". The Journal of Biological Chemistry. 275 (24): 18581–5. doi:10.1074/jbc.C000126200. PMID 10849448. ↑ Howlett CJ, Robbins SM (Mar 2002). "Membrane-anchored Cbl suppresses Hck protein-tyrosine kinase mediated cellular transformation". Oncogene. 21 (11): 1707–16. doi:10.1038/sj.onc.1205228. PMID 11896602. ↑ Howlett CJ, Bisson SA, Resek ME, Tigley AW, Robbins SM (Apr 1999). "The proto-oncogene p120(Cbl) is a downstream substrate of the Hck protein-tyrosine kinase". Biochemical and Biophysical Research Communications. 257 (1): 129–38. doi:10.1006/bbrc.1999.0427. PMID 10092522. ↑ Scott MP, Zappacosta F, Kim EY, Annan RS, Miller WT (Aug 2002). "Identification of novel SH3 domain ligands for the Src family kinase Hck. Wiskott-Aldrich syndrome protein (WASP), WASP-interacting protein (WIP), and ELMO1". The Journal of Biological Chemistry. 277 (31): 28238–46. doi:10.1074/jbc.M202783200. PMID 12029088. ↑ Ward AC, Monkhouse JL, Csar XF, Touw IP, Bello PA (Oct 1998). "The Src-like tyrosine kinase Hck is activated by granulocyte colony-stimulating factor (G-CSF) and docks to the activated G-CSF receptor". Biochemical and Biophysical Research Communications. 251 (1): 117–23. doi:10.1006/bbrc.1998.9441. PMID 9790917. ↑ Shivakrupa R, Radha V, Sudhakar C, Swarup G (Dec 2003). "Physical and functional interaction between Hck tyrosine kinase and guanine nucleotide exchange factor C3G results in apoptosis, which is independent of C3G catalytic domain". The Journal of Biological Chemistry. 278 (52): 52188–94. doi:10.1074/jbc.M310656200. PMID 14551197. 1 2 Briggs SD, Bryant SS, Jove R, Sanderson SD, Smithgall TE (Jun 1995). "The Ras GTPase-activating protein (GAP) is an SH3 domain-binding protein and substrate for the Src-related tyrosine kinase, Hck". The Journal of Biological Chemistry. 270 (24): 14718–24. doi:10.1074/jbc.270.24.14718. PMID 7782336. Geyer M, Fackler OT, Peterlin BM (2001). "Structure--function relationships in HIV-1 Nef.". EMBO Rep. 2 (7): 580–5. doi:10.1093/embo-reports/kve141. PMC 1083955 . PMID 11463741. Lake JA, Carr J, Feng F, Mundy L, Burrell C, Li P (2003). "The role of Vif during HIV-1 infection: interaction with novel host cellular factors.". J. Clin. Virol. 26 (2): 143–52. doi:10.1016/S1386-6532(02)00113-0. PMID 12600646. Greenway AL, Holloway G, McPhee DA, Ellis P, Cornall A, Lidman M (2004). "HIV-1 Nef control of cell signalling molecules: multiple strategies to promote virus replication.". J. Biosci. 28 (3): 323–35. doi:10.1007/BF02970151. PMID 12734410. Tolstrup M, Ostergaard L, Laursen AL, Pedersen SF, Duch M (2004). "HIV/SIV escape from immune surveillance: focus on Nef.". Curr. HIV Res. 2 (2): 141–51. doi:10.2174/1570162043484924. PMID 15078178. Joseph AM, Kumar M, Mitra D (2005). "Nef: "necessary and enforcing factor" in HIV infection.". Curr. HIV Res. 3 (1): 87–94. doi:10.2174/1570162052773013. PMID 15638726. Stove V, Verhasselt B (2006). "Modelling thymic HIV-1 Nef effects.". Curr. HIV Res. 4 (1): 57–64. doi:10.2174/157016206775197583. PMID 16454711. Lichtenberg U, Quintrell N, Bishop JM (1992). "Human protein-tyrosine kinase gene HCK: expression and structural analysis of the promoter region.". Oncogene. 7 (5): 849–58. PMID 1373873. Hradetzky D, Strebhardt K, Rübsamen-Waigmann H (1992). "The genomic locus of the human hemopoietic-specific cell protein tyrosine kinase (PTK)-encoding gene (HCK) confirms conservation of exon-intron structure among human PTKs of the src family.". Gene. 113 (2): 275–80. doi:10.1016/0378-1119(92)90407-G. PMID 1572549. Kim JW, Sim SS, Kim UH, Nishibe S, Wahl MI, Carpenter G, Rhee SG (1990). "Tyrosine residues in bovine phospholipase C-gamma phosphorylated by the epidermal growth factor receptor in vitro.". J. Biol. Chem. 265 (7): 3940–3. PMID 1689310. Holtrich U, Bräuninger A, Strebhardt K, Rübsamen-Waigmann H (1992). "Two additional protein-tyrosine kinases expressed in human lung: fourth member of the fibroblast growth factor receptor family and an intracellular protein-tyrosine kinase.". Proc. Natl. Acad. Sci. U.S.A. 88 (23): 10411–5. doi:10.1073/pnas.88.23.10411. PMC 52938 . PMID 1720539. Lock P, Ralph S, Stanley E, Boulet I, Ramsay R, Dunn AR (1991). "Two isoforms of murine hck, generated by utilization of alternative translational initiation codons, exhibit different patterns of subcellular localization.". Mol. Cell. Biol. 11 (9): 4363–70. PMC 361298 . PMID 1875927. Ziegler SF, Marth JD, Lewis DB, Perlmutter RM (1987). "Novel protein-tyrosine kinase gene (hck) preferentially expressed in cells of hematopoietic origin.". Mol. Cell. Biol. 7 (6): 2276–85. PMC 365352 . PMID 3453117. Lee CH, Leung B, Lemmon MA, Zheng J, Cowburn D, Kuriyan J, Saksela K (1995). "A single amino acid in the SH3 domain of Hck determines its high affinity and specificity in binding to HIV-1 Nef protein.". EMBO J. 14 (20): 5006–15. PMC 394604 . PMID 7588629. Liao F, Shin HS, Rhee SG (1993). "In vitro tyrosine phosphorylation of PLC-gamma 1 and PLC-gamma 2 by src-family protein tyrosine kinases.". Biochem. Biophys. Res. Commun. 191 (3): 1028–33. doi:10.1006/bbrc.1993.1320. PMID 7682059. Briggs SD, Bryant SS, Jove R, Sanderson SD, Smithgall TE (1995). "The Ras GTPase-activating protein (GAP) is an SH3 domain-binding protein and substrate for the Src-related tyrosine kinase, Hck.". J. Biol. Chem. 270 (24): 14718–24. doi:10.1074/jbc.270.24.14718. PMID 7782336. Robbins SM, Quintrell NA, Bishop JM (1995). "Myristoylation and differential palmitoylation of the HCK protein-tyrosine kinases govern their attachment to membranes and association with caveolae.". Mol. Cell. Biol. 15 (7): 3507–15. PMC 230587 . PMID 7791757. Saksela K, Cheng G, Baltimore D (1995). "Proline-rich (PxxP) motifs in HIV-1 Nef bind to SH3 domains of a subset of Src kinases and are required for the enhanced growth of Nef+ viruses but not for down-regulation of CD4.". EMBO J. 14 (3): 484–91. PMC 398106 . PMID 7859737. Cheng G, Ye ZS, Baltimore D (1994). "Binding of Bruton's tyrosine kinase to Fyn, Lyn, or Hck through a Src homology 3 domain-mediated interaction.". Proc. Natl. Acad. Sci. U.S.A. 91 (17): 8152–5. doi:10.1073/pnas.91.17.8152. PMC 44563 . PMID 8058772. Wang AV, Scholl PR, Geha RS (1994). "Physical and functional association of the high affinity immunoglobulin G receptor (Fc gamma RI) with the kinases Hck and Lyn.". J. Exp. Med. 180 (3): 1165–70. doi:10.1084/jem.180.3.1165. PMC 2191633 . PMID 8064233.